The Harley-Davidson BT was more commonly known as the Super 10. In 1960, Harley-Davidson consolidated the Model 165 and Hummer lines into the Super-10. Back in the 50's and 60's, many states had a "junior driver's license" which allowed 14-year-olds to drive motorcycles under 5 Horsepower. These laws were prevalent in the mid-western states. In those days, Go-Karts and MiniBikes were quite popular, and Harley-Davidson tapped the junior market with special versions of the Model 165, Super-10, and Pacer. The U models had a restricted intake system to drop the horsepower to just below 5, making them eligible for junior licensing restrictions. The 125cc Hummer was already eligible, since it only produced 3.5 hp, but apparently many people wanted the increased power and style of the Model 165. The Super-10 (1960-1961) and Pacer (1962-1965) also came in BTU variants. In 1962, the Pacer BTU had the 165cc engine, while the standard Pacer BT had the new 175cc version. 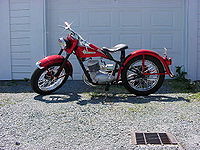 It is believed that the 1963-1965 BTU's used the 175cc engine. See the Ranger and Pacer chapters for more on the mix of 165 and 175cc engines in 1962. The BTU's achieved the "throttling effect" by using a special cylinder head with a restricted intake port rather than a different carburetor. This page was last edited on 9 February 2011, at 01:37.